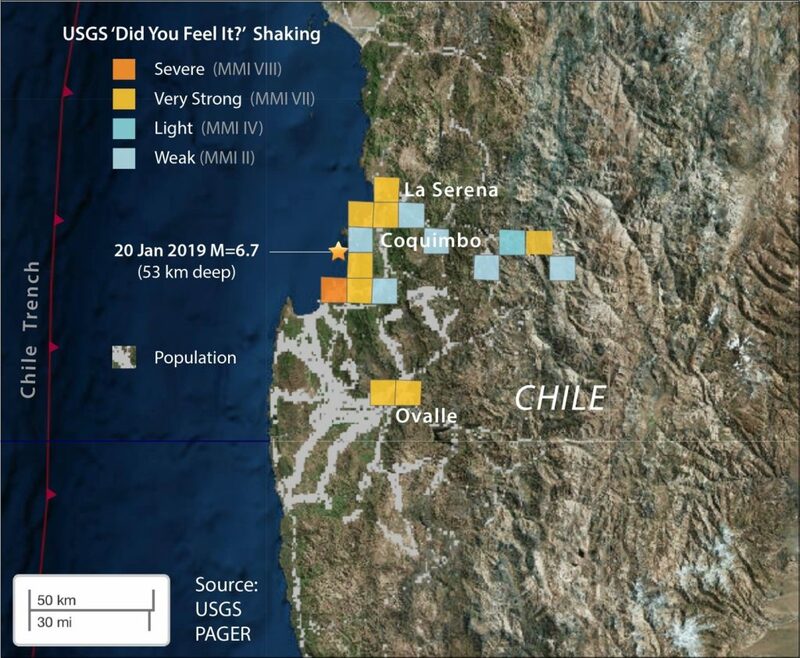 Tags: Earthquake Alert Network ( 23 ), Earthquakes ( 110 ), Peru-Chile Trench, QCN Quake-Catcher.net ( 8 ), Shake Alert System ( 23 ), Strong shaking from central coastal Chile earthquake, temblor ( 52 ), What does it reveal about the next megathrust shock? Jason R. Patton, Ph.D.; Jean Baptiste Ammirati, Ph.D., University of Chile National Seismological Center; Ross Stein, Ph.D.; Volkan Sevilgen, M.Sc. An earthquake located just beneath the subduction zone of the Peru-Chile Trench strongly shook Coquimbo and La Serena, and was felt up to 400 km away in Santiago. This quake struck just north of the edge of the M=8.3 Illapel megathrust earthquake, which launched a destructive tsunami in 2015. 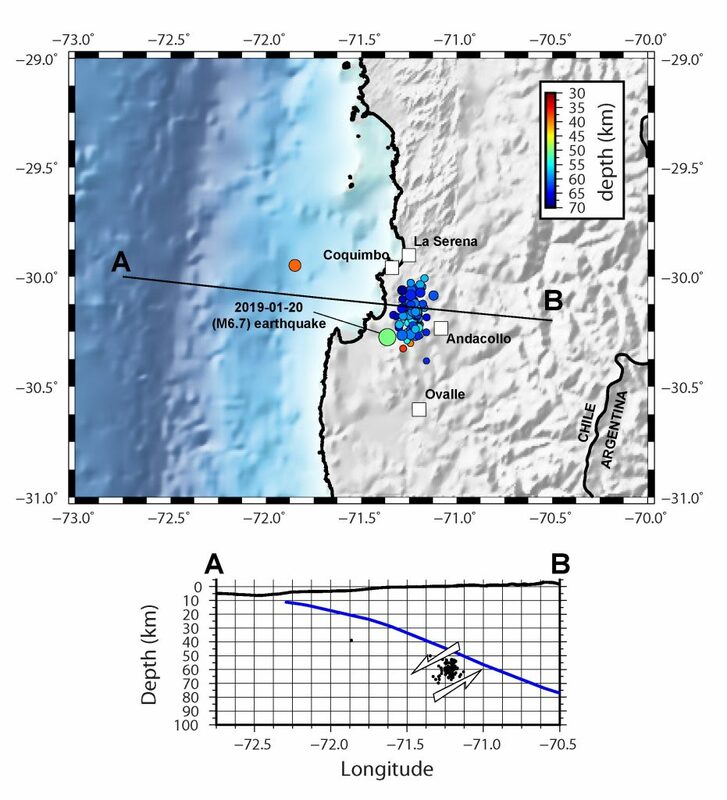 On 20 January 2019 there was an M=6.7 earthquake along the convergent plate boundary on the west coast of Chile, about the same size as the 1994 Northridge quake in southern California or about the size of an earthquake that might hit the San Francisco Bay area In northern CA. The earthquake was quite deep (53 km, or about 33 miles), so was not as damaging as those CA examples. However, it was broadly felt with over 800 USGS Did You Feel It reports at the time we write this article. For most earthquakes that have a potential to damage people, buildings, or infrastructure, the U.S. Geological Survey prepares an estimate of these types of damage. The PAGER alert is based on the strength of measured and modeled shaking (explained in greater detail here). For this M=6.7 earthquake PAGER assigns a 43% chance that there will be between 10 and 100 fatalities, and a 53% chance that there will be economic losses between $10 and $100 million (USD). The largest city near the earthquake, Coquimbo, was hit by a tsunami in 2015 when the adjacent section of the subduction zone ruptured. Below is a photo taken following the 2015 M=8.3 earthquake and tsunami. There are over 300,000 people in Coquimbo and the nearby city of La Serena that likely experienced strong to severe shaking intensity from the M=6.7 event. We were quite surprised that the M=6.7 actually caused as much damage as it has, especially in comparison with the 2015 M=8.3 earthquake, which shook less despite being about 300 times larger. The Chilean Navy (SHOA) alert system worked very well yesterday. The SHOA tsunami alert that was withdrawn about 30 min after the earthquake, once it was clear that this was not a subduction event. During that half hour, several thousand people followed instructions and took evacuation routes until told to return. This is a valuable test-run of tsunami warnings, and a credit to Chile. Plate motions: locked or slipping? The deep marine trench offshore the west coast of Chile is formed by a subduction zone where the Nazca plate is shoved beneath the South America plate. This megathrust fault has a variety of material properties and structures that appear to control where the plates are locked, and so accumulating stress towards the next large earthquake, and where they are slipping ‘aseismically’ past each other, and so with a low likelihood of hosting a great quake. Below is a map that shows the location of plate boundaries in the region. The majority of high hazard is associated with the subduction zone fault. 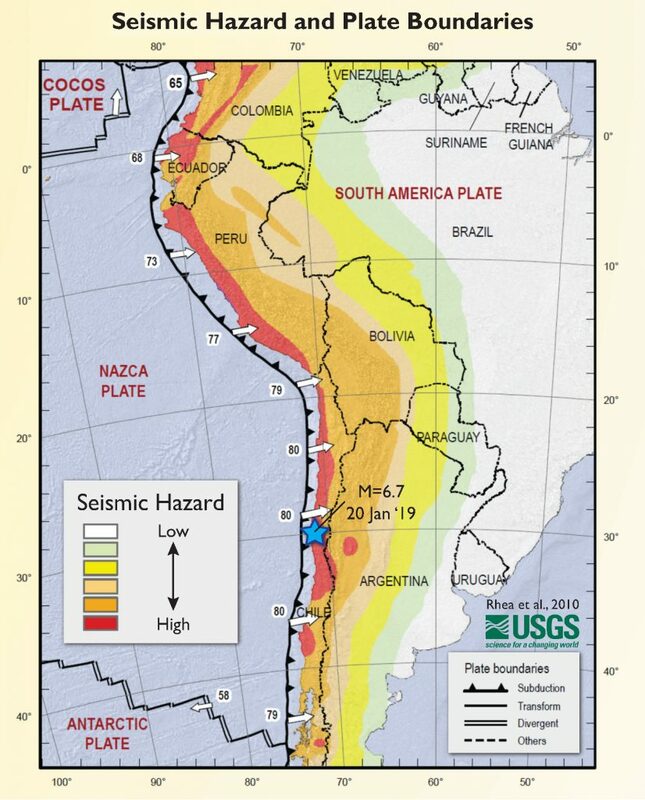 Seismic hazard for South America (Rhea et al., 2010). The numbers (“80”) indicate the rate at which the Nazca Plate is subducting beneath South America. 80 mm/yr = 3 in/yr. Are you in earthquake country? Do you know what the earthquake hazards are where you live, work, or play? Temblor uses a model like the USGS model to forecast the chance that an area may have an earthquake. 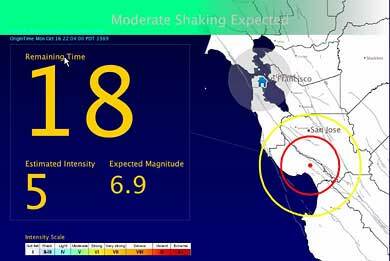 Learn more about your temblor earthquake score here. These locked zones are generally where megathrust earthquakes nucleate. 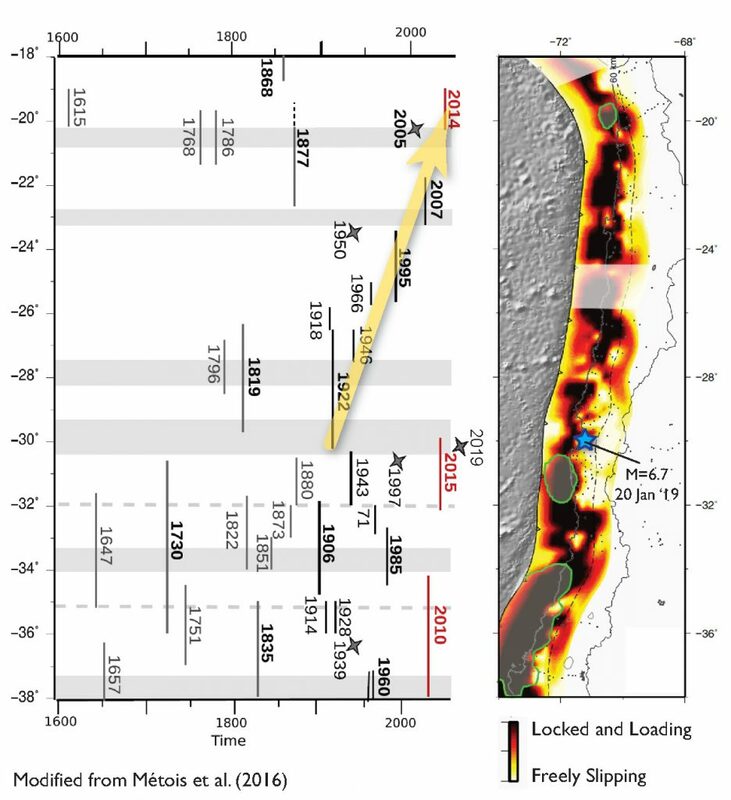 In Chile, below a depth of about 50 km (~30 miles) the plate interface is not locked (Gardi et al., 2017), so megathrust fault earthquakes are generally shallower than this depth. Earthquakes deeper than this generally occur within the Nazca plate slab, called ‘slab’ earthquakes because they lie are within the subducting slab. Often these slab earthquakes are extensional, as was the 20 January 2019 M=6.7 quake. Cross section of the subduction zone that forms the Chile Trench. Below is an aftershock map prepared by Jean-Baptise Ammirati at the University of Chile and the Chilean National Seismic Network. We have added the arrows to suggest that the aftershock alignment hints at a west-dipping tensional fault. Much of the megathrust has slipped during earthquakes in the 20th and 21st centuries. The historic record of earthquakes is shown in the figure below. The vertical lines represent the size and extent of the earthquake. The largest earthquake ever recorded by seismometers was the 1960 M=9.5 Chile shock that caused widespread damage, triggered landslides, and generated a trans-oceanic tsunami that destroyed the built environment and caused casualties in Hawaii, Japan, and the west coast of the USA (e.g. Crescent City). In 1922 there was an M=8.5 earthquake in the region of today’s M=6.7 quake (Ruiz and Madariaga, 2018). According to Dr. Raul Madariaga, this 1922 event was a subduction zone earthquake that generated a trans-oceanic tsunami which caused damage in Japan and launched a 9m (30 feet) wave just north or Coquimbo, Chile. There has not been a large earthquake in the area of the 1922 earthquake in almost a century, a time longer than average when compared to the rest of the subduction zone. Nevertheless, there was a 129-year pause between the 1877 and 2005 events to the north. Also remarkable is the apparent northward progression of great quakes with time from the 1922 event, to 1946, 1966, 1995, 2007, and 2014, for a distance of 1200 km (11° of latitude). Historic earthquake record (on the left) coincides with the map of the megathrust showing an estimate of where the fault is stuck and where it may be freely slipping. The M=6.7 earthquake epicenter is located near the blue star. Slab earthquakes are labeled with a gray star (e.g. 1997 discussed below). month of July 1997, until it produced the 15 October Punitaqui 1997 earthquake. Seismologists will monitor this event to see if there is any seismic migration, which is rare. Geologists use GPS data, remote sensing data, and physical measurements of the Earth to monitor how the Earth deforms during the earthquake cycle. The observations can be “inverted” to estimate where the fault is locked and where it is slipping. 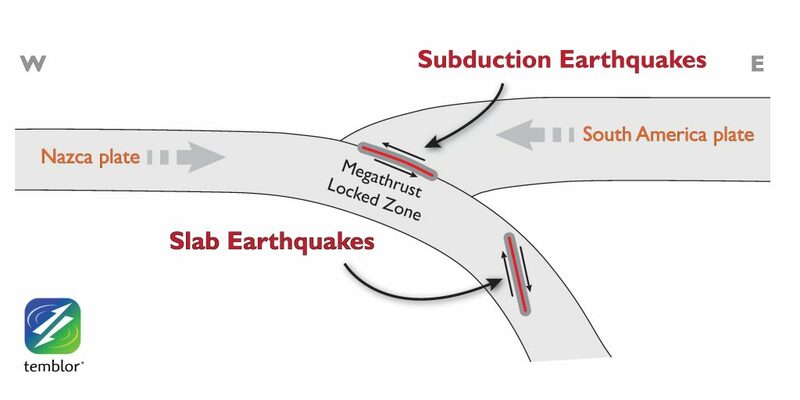 The figure above shows an interpretation of where the subduction zone fault is locked, and where it may be slipping. Note how the M=6.7 earthquake struck in an area where the megathrust may be freely slipping. The historic record of earthquakes along the subduction zone makes clear that the absence of megathrust earthquakes for almost a century at the location of the M=6.7 event is unusually long. While it is possible that the Coquimbo portion of the megathrust is not fully locked, it would be prudent for those living along the coast of Chile would to practice their earthquake drills and prepare their homes and finances to withstand effects from a future large earthquake. 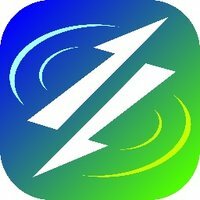 Stay tuned to the latest news about earthquake, tsunami, landslide, liquefaction, and other natural hazards by signing up for our free email service here. Learn more about the plate tectonics in this region here.